Make the chicken In a large bowl, whisk the olive oil with the lemon juice, garlic, salt and spices. Add the chicken and onions and turn to coat in the marinade. Cover and refrigerate for 1 hour or overnight. Preheat the oven to 450°. Line a large rimmed baking sheet with foil and arrange the chicken on it skin side up. Add the onions. Scrape any remaining marinade in the bowl over the chicken. Roast for about 40 minutes, until the chicken and onions are browned and the chicken is cooked through. Transfer the chicken to a cutting board and coarsely shred with a knife and fork. Meanwhile, make the salad In a small bowl, whisk the crème fraîche with the lemon zest and 1 teaspoon of the lemon juice; season with salt. In a medium bowl, whisk the remaining 2 tablespoons of lemon juice with the olive oil; season with salt and pepper. Add the lettuce, cilantro, scallions and jalapeño and toss to coat. 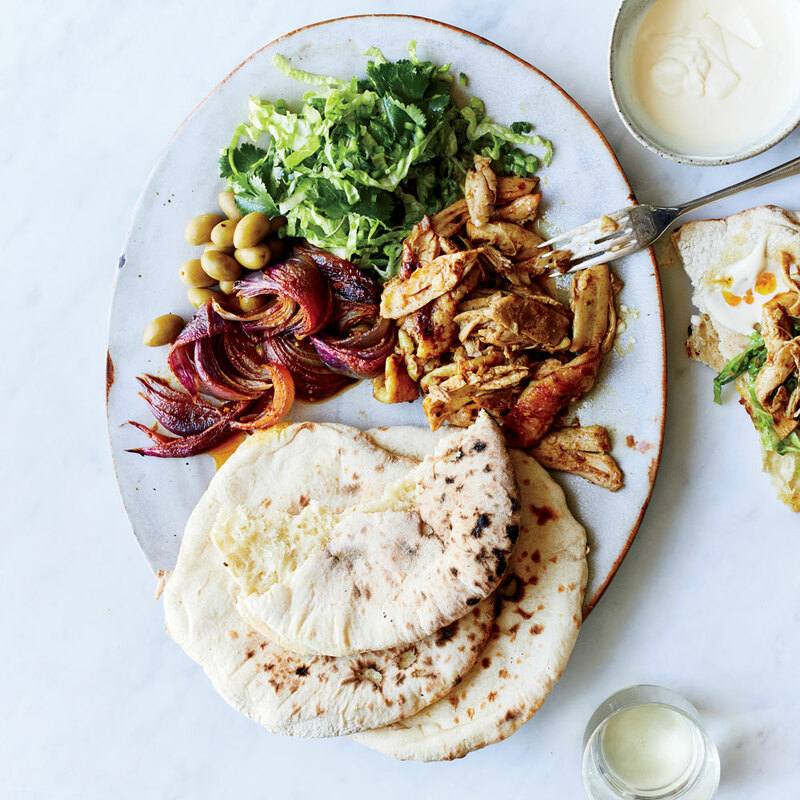 On a large platter, arrange the salad with the chicken, onions, pita bread and olives. Serve with the lemon crème fraîche alongside. The lemon crème fraîche can be refrigerated for up to 1 day. Review Body: My family and I loved this! I used Greek yogurt instead of creme fraiche, since that was what I had on hand (and is cheaper). The chicken comes out so tender and flavorful! Next time, I'd throw in an extra onion, because they were so good. I scaled it up another 50%, and it worked great. I have the cookbook this came from (Around the World in 50 Salads), and the other recipes look just as good! Review Body: Totally YUM! I actually only used the chicken portion from this recipe and served it with pitas, tzatiki sauce, shredded lettuce, chopped onions and tomatoes as a sandwich. The flavor on the chicken is really, really good! A definite keeper. Review Body: Great recipe and ingredients blended perfectly! Review Body: Shawarma is one of my favorite foods, I would definitely add this recipe to my list. Review Body: can’t wait to make this again. Fabulous flavors! Review Body: I'd switch the salad for something else and boom. Review Body: Fabulous flavors and so easy to make!